While major bicycle manufacturers employed new mass production techniques adopted from the firearm and sewing machine industries, the Wrights remained small scale and produced hand-crafted originals. Their advertising emphasized high-quality frame construction and mechanisms, and a polished, durable enamel finish. Here, Orville (right) works with Ed Sines on bicycle frames in 1897. During their peak production years of 1896 to 1900, Wilbur and Orville built about 300 bicycles and earned $2,000 to 3,000 per year. Their top-of-the-line model, the Van Cleve sold for $65. The less expensive St. Clair sold for $42.50. Only five bicycles manufactured by the Wright brothers are known to exist. 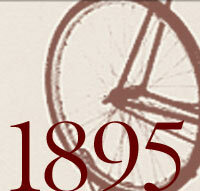 The brothers moved the Wright Cycle Co. for the last time in 1897, to 1127 West Third Street. Here they built all their experimental aircraft, including the first powered airplane in 1903. Henry Ford purchased the shop, along with the Wrights’ house, and moved them in 1937 to his Greenfield Village complex in Dearborn, Michigan, where they are open to the public. The Wrights’ top-of-the-line model was the Van Cleve, named after their mother’s pioneering ancestors, who were among Dayton’s first settlers. It was priced at $65.